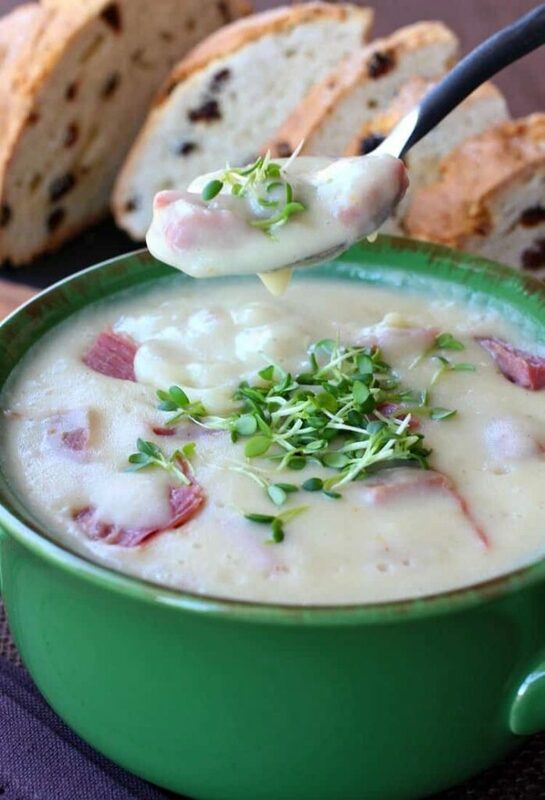 This Creamy Potato and Corned Beef Chowder is such a tasty way to use up leftover corned beef! 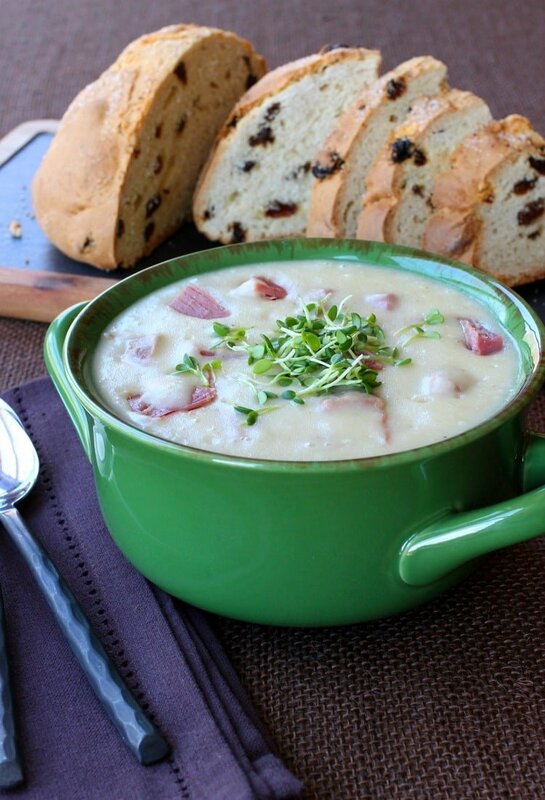 Soup recipes like this chowder make leftovers disappear! Make sure you try our delicious Crock Pot Corned Beef! 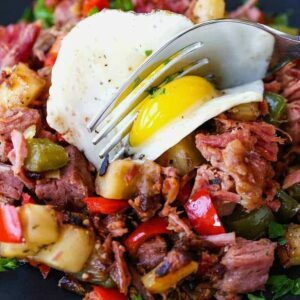 We like to make more than we need so we can make leftover recipes like this soup or Corned Beef Hash and Fried Eggs! Made Roasted Cabbage, too? You can use those leftovers in this soup recipe too! Leftovers. For some people leftovers are a problem, for us it’s the best part about cooking. 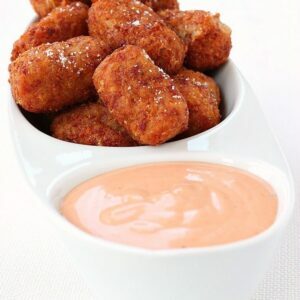 Here’s a few more leftover corned beef recipes you can try! 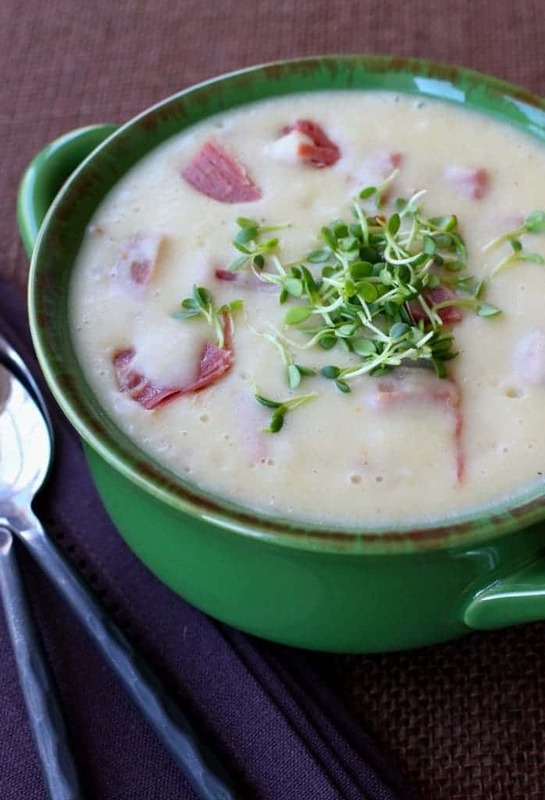 Or you can make this delicious Creamy Potato and Corned Beef Chowder. So the base of this soup recipe is like a baked potato chowder, but with shredded cabbage and corned beef. 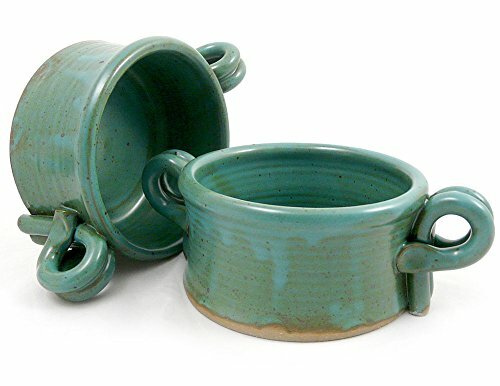 If you have leftover cooked cabbage from St. Patrick’s Day you can throw that in here too. Don’t run out and buy more cabbage, it’s another great leftover use! If you use leftover, cooked cabbage just add the cabbage in the pot after you cook the onions since it’s already cooked. For this soup recipe you are going to need about three heaping cups of corned beef so definitely plan ahead when you pick out the size of corned beef you’re going to be making for dinner. Sneak some of the leftovers into the back of the refrigerator before you serve it to the family! So I guess as opposed to some people that don’t like leftovers, we actually make larger amounts of food so we have leftovers to make soup recipes like this one. Also, if you really want to make this soup but don’t want to cook a whole corned beef you can head to your deli and have them slice some up on the thicker side for you. 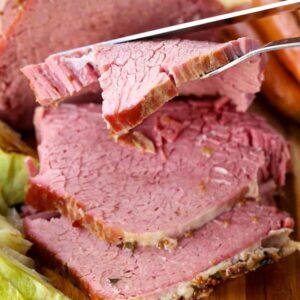 Corned beef is something I’ve never gotten before at my deli counter, until I started making all these leftover corned beef recipes – and absolutely loving them. I mean, sometimes you just don’t have a whole corned beef laying around, ready to cook. So take a few shortcuts! We also had these sprouts leftover from our Corned Beef Irish Nachos so I thought they’d look good for garnish. Turns out they tasted pretty darn good in the soup, too so it worked out all around. Garnish is another thing I’ve learned that really makes a difference in recipes. Even some chopped parsley or scallions can really make the flavor pop in your food, so try and get the garnish on there! Grab a few beers and get this pot of soup on the dinner table. We can keep on celebrating all weekend long! 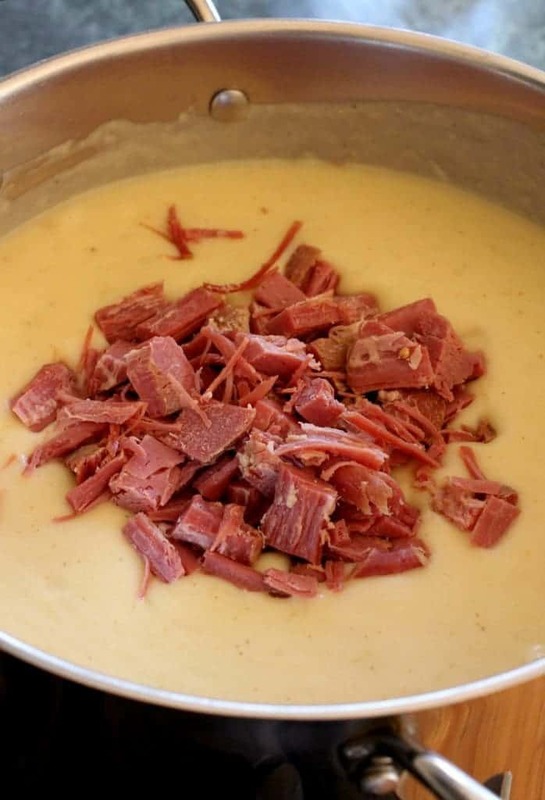 This comforting soup recipe is made with leftover corned beef, but you can also grab corned beef right from your deli! Add the onions and cabbage, cooking until the cabbage is wilted and the onions are soft, about 7-8 minutes. Add the potatoes, chicken broth, salt, pepper, celery salt and garlic powder to the pot. Stir and bring to simmer for 30 minutes, covered. 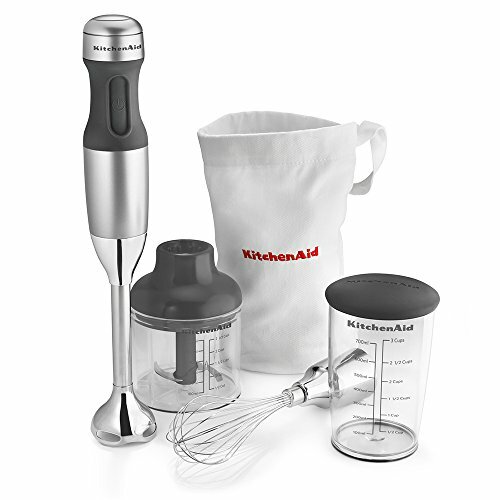 Blend the soup using a stick blender, or let the soup cool and transfer to a regular blender. Blend until smooth. Add the cream and corned beef, heat until warmed through and test for seasonings. Garnish with sprouts if desired. 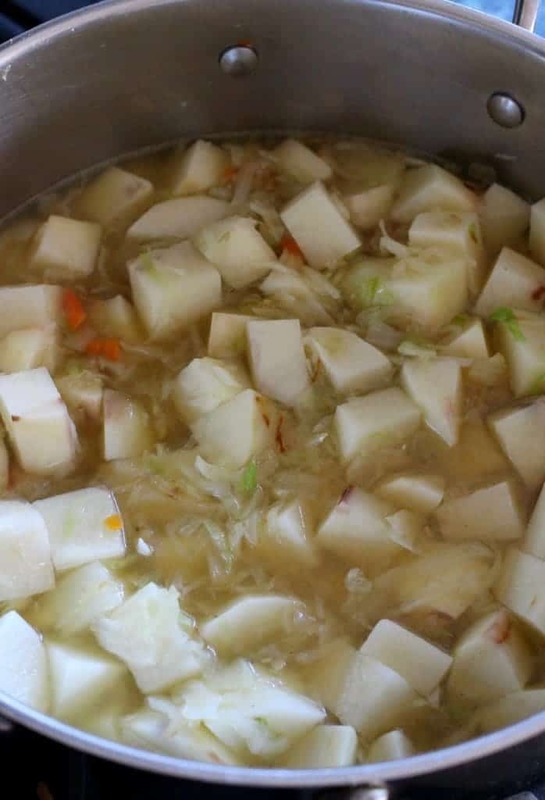 You can blend the soup but still leave some of the potatoes whole, it doesn't have to be perfectly smooth. I ❤️ This recipe. The only thing i did was reduce the salt to one teaspoon because of the boullion broth i had to use and even then my father and brother thought it was too salty. Next time I’ll leave the salt out and only add it after its all cooked up if needed. The corned beef adds alot of salt depending on the cut and how it had been previously cooked. 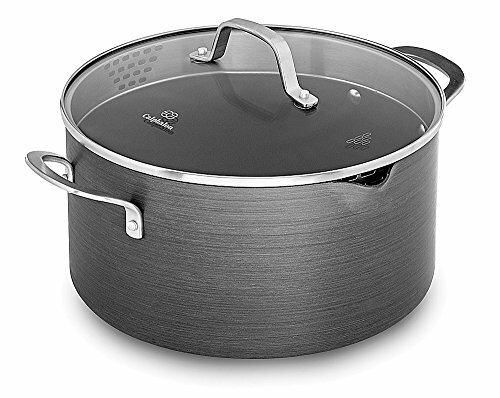 However – i really really love it and will buy bigger corned beefs now so i can make this the next day. Thanks for the recipe. Your welcome – so glad you liked it! If you used boullion that would be considerably more salty than just chicken stock or broth, so yes you’d have to reduce the salt. LEAVE IT TO THE IRISH…WASTE NOT WANT NOT. I USED HALF A HEAD OF CABBAGE, CHOPPED CELERY AND CARROTS AND “BABY” REDS QUARTERED. YUM. 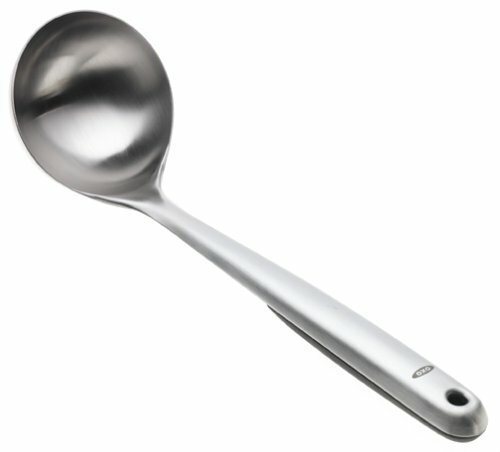 NO NEED TO PUREE. JUST EAT IT AS IS. I’M A FAN OF POTATOES AND CABBAGE JUST BOIILED TOGETHER ANYWAY.